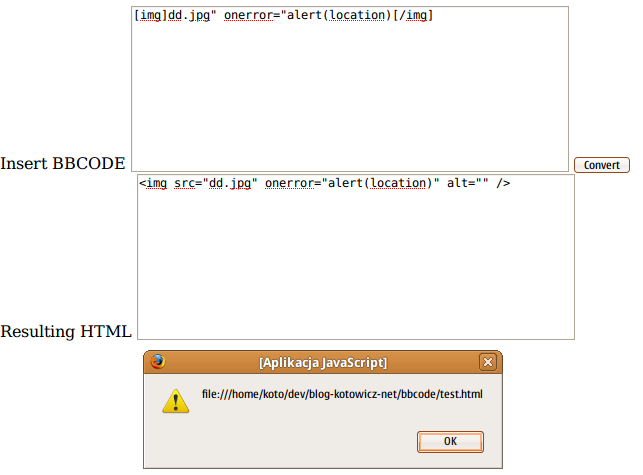 One of the wrong ways to protect from XSS is to use BBCode. Today I encountered yet another blog post (update: post deleted by author, see comment #1) claiming that author used a BBCode implementation so that "The code is encoded and perfectly safe and resilient to possible XSS attacks". I just just had to put that to a test. Read on to find out how "perfect" was the code and what is wrong with using BBCode for XSS protection. Regexp for protection - just don't do it! It took just 5 minutes to exploit this "perfect" protection. Not that I'm smart, it's the protection that is so lame. I tried just a simple vector attack, one of many that would possibly fit for this particular script. It gets even worse because browsers are usually forgiving for the invalid HTML syntax. 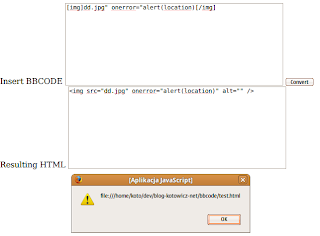 There are many XSS attack vectors that target an invalid regex that did not account for some special case. Recent Twitter @onmouseover flaw was most likely possible because of an invalid regex. When you're trying regexps to do your filtering, it will quickly evolve into complicated, almost cryptic code that noone discovered holes in yet. That gets really complicated and it is in practice, that's why we've had so many bbcode XSS flaws in the past. Developer, as it was in this case, just includes a 3rd party bbcode library and hopes for the best, thinking he's secure because of using some buzzword. Library is not magic - it's an additional code and more code = more errors. Seriously - it's just harder to be secure down that road, so let's just not go there. If you need to allow some HTML from users on your pages - use a full blown parser! Start from the perfectly clean HTML root node and keep adding the valid nodes (if they match your whitelist) until you're done. Or throw all your HTML into a proper HTML parser object and then traverse the tree leaving only safe nodes/attributes. Whitelist is the key word for both algorithms. There is no place for a malicious code coming from almost-valid HTML syntax to pass through this. If there's anything wrong with the HTML, it would most likely be your incomplete whitelist (or some weird html/tidy attack vector, but I doubt it). And be skeptical about 3rd party code you're including. Server side BBCode parsing may also be wrong (and likely from the same reasons that the JS version) - try http://www.bbcode-to-html.com/ with my example code. As usual - the code displayed here is on my github. and it has become the virtual main street of the world.